WHEN MOST PEOPLE think of baking Christmas goodies, lard and anise may not come to mind as key ingredients. Unless they’re New Mexicans. Every December here, it’s blessedly impossible to avoid rich, sandy-textured biscochitos—or their beguiling aroma. When it was named the state cookie in 1989, this shortbread-style cookie wasn’t being honored alone; the grandmas, moms, and aunties who made them were also being implicitly recognized. In my 35 years of living in New Mexico, no one has ever shared their own recipe for biscochitos with me. The list of ingredients and the instructions are always credited to a matriarch, or a special tía. If you look up “biscochito” online, you could easily get the impression that Don Diego de Vargas and his cuadrilla galloped into what would become New Mexico with batches of the cookies stuffed in their saddlebags. The provenance isn’t all that clear, but we do know that the cookie bears similarities to various old Spanish sugar cookies. Anise, the Mediterranean spice and major biscochito flavoring, came to northern New Mexico in the early years of settlement, according to the historian William W. Dunmire. Because the spice was not easily obtained, it was saved for special occasions. 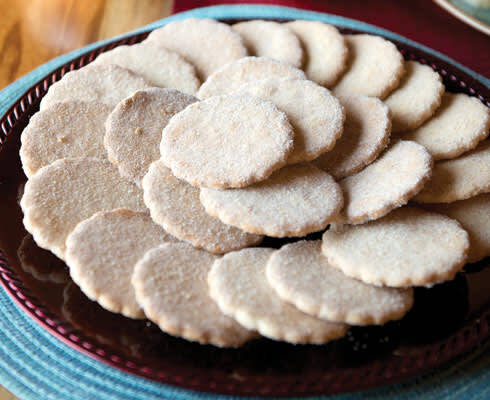 Biscochitos began appearing in New Mexico cookbooks close to a hundred years ago. I sat down recently to talk with my Tesuque Village neighbor Rita Padilla Haufman. The Padillas have deep roots here; her family settled the area behind my home in 1710. Rita grew up making biscochitos with her mother Selinis in the same house she lives in today. She relates a tale, from years back, of making dozens for her husband, Tom’s office Christmas party. She stashed them in a cupboard high above the refrigerator. When the day for the party came, she pulled down the container and discovered not a single cookie. Tom and their son had discovered her hiding place and pilfered a few each day. Oops. It remains a legend among Tom’s colleagues as the disastrous Year Without Rita’s Biscochitos. Per tradition, though, Rita never really refers to them as her biscochitos; she always refers to them as her mother’s, Selinis Padilla’s. Biscochitos bake up as altogether greater than the sum of their humble parts. They meld warm notes of anise and cinnamon with background hints of rum or brandy. Lard, the oft-maligned creamy white pork fat, contributes crucial airiness and flakiness (the same qualities it imparts to the best pie crusts). Today Rita and most biscochito bakers use the one-pound cube of Morrell lard, found commonly in the baking aisle at New Mexico markets every holiday season. Rita emphasizes how Selinis’ proportions of ingredients are key to the cookies’ popularity among her large circle of friends. Of equal importance, though, is to avoid overworking the stiff, somewhat dry dough. Her light touch yields tender cookies. Some people cut the dough into fleur-de-lis shapes, a relic from the Spanish monarchy’s connection to France’s House of Bourbon. Others press out simple diamonds. The Padillas’ biscochitos have always been cut into scalloped rounds with a wooden-handled cookie cutter handed down through the family for generations. Baking biscochitos, a family tradition. Unless you’re cooking for vegetarians, don’t substitute any other fat for the lard, which is essential to the taste and flaky texture. A great biscochito should melt in your mouth, and that requires a generous amount of vigorous whipping to aerate the lard-and-sugar base, a minimum of liquid, and a delicate touch in handling the dough. Serve as a snack with tea or hot chocolate, as a light dessert, or—oh, heck—for breakfast. Preheat oven to 350° F. Sift together flour, baking powder, and salt. Beat lard in electric mixer, gradually adding sugar, and beat until extremely fluffy and light, for no less than 8 minutes. Stop mixer every couple of minutes and scrape sides of mixing bowl. Add aniseed, followed by eggs. Mix in dry ingredients, adding about half of mixture at a time. Stop mixer as you make each addition, and beat no longer than necessary to incorporate dry ingredients. Sprinkle rum over dough and beat it in. 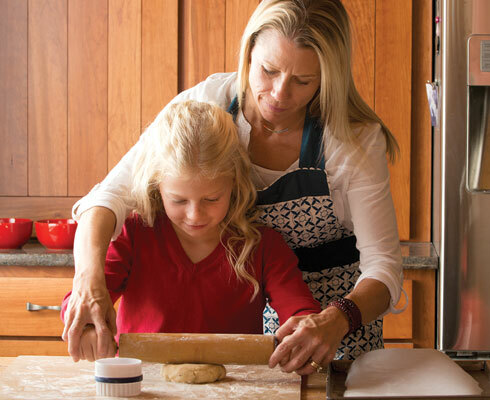 A stiff pie-crust type of dough is what you’re seeking. Scoop out a handful of dough and roll it out about 3/8-inch thick on a very lightly floured work surface. Cut with a small, round scalloped cookie cutter or other simple shape. Avoid handling the dough any more than necessary. Transfer cookies to ungreased cookie sheets. Repeat with small portions of the dough at a time. Bake cookies for 10 to 12 minutes, until just set and pale golden. When cookies are done, cool briefly on baking sheets, then gently dunk cookies in cinnamon sugar. Transfer to absorbent paper to finish cooling. Christmas pistachios presented in New Mexico–designed Nambé ware. Like the pecans that were featured in November’s “Tasting NM” (mynm.us/recipes915), pistachios are a robust southern NM crop. Mix them up with red chile for an only-in-NM party snack. Warm butter in a large skillet over medium heat. Stir in pistachios, coating them on all sides with butter. Sprinkle in chile and 1⁄2 teaspoon of salt, adding more if you wish after tasting. Dump pistachios out onto absorbent paper to cool. Mound into a bowl or seal tightly in a jar to keep for up to several weeks at room temperature. Sugar-and-spice piñons and pepitas presented in New Mexico–designed Nambé ware. 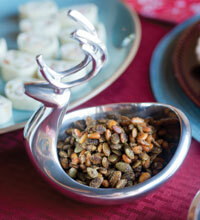 When you toss pine nuts and pumpkin seeds together with a little heat and sweetness, the blend becomes holiday-worthy. Line a baking sheet with parchment paper. Combine butter and sugar in a heavy skillet over medium heat. 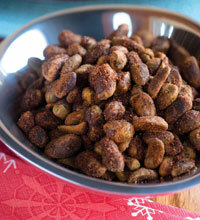 Stir in piñons and pepitas, coating them with the butter-sugar mixture. Add chile and continue stirring to coat well, and warm through, just until pepitas begin crackling. Pour nuts onto baking sheet to cool briefly. Serve warm or cool thoroughly and store in a tightly covered jar for up to several days. Holiday tortilla pinwheels presented in New Mexico–designed Nambé ware. Tortilla pinwheels stuffed with green chile and cream cheese, a popular year-round party finger food, get a little holiday makeover when flecked with red and green. If you wish, serve with a favorite salsa on the side. Combine cream cheese and garlic in a small bowl. Spread cream cheese mixture over tortillas. Sprinkle each tortilla equally with chile, cheddar cheese, and olives. 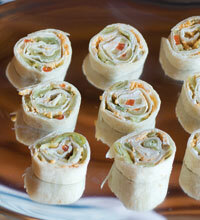 Roll tortillas up snugly. Wrap individually in plastic and chill for at least 1 hour or as long as overnight. Many New Mexicans, especially those who grew up in the central third of the state, know these party treats simply as “chiles rellenos.” They include chile, but they are not stuffed at all. Instead, these are batter-dipped beef-and-chile fritters, most likely created as an expedient way to mimic the flavor of a meaty relleno when serving crowds gathered for holidays and other celebrations. Typically, they are made ahead in big batches, cooled, then stored in paper-lined coffee cans to enjoy at room temperature over a few days. However, they are at their very best when fresh and hot. Warm a Dutch oven or other large, heavy pot over high heat. Salt meat and then place it in skillet and brown on both sides, about 5 minutes total. Scatter garlic cloves around meat. Pour in stock, and scrape up browned bits from bottom. Reduce heat to medium-low, cover, and simmer about 1 1/2 hours, until tender. Check after about 1 hour and if liquid is in danger of evaporating completely, pour in a few tablespoons of hot water. Let meat cool in pan liquid and when it’s cool enough to handle, discard fat and pull meat into at least a half dozen chunks. Reduce remaining cooking liquid to about 2 tablespoons. Chop together in meat and cooking liquid a food processor, pulsing just until meat is chopped uniformly. Add chile and pulse in several short bursts until chile is mixed in evenly. Mixture should be fairly finely chopped, but pieces of chile should be still visible. Mixture should be well-seasoned too. Add salt if you wish. Check texture of mixture. If it holds together when compacted tightly, it’s ready. If not, add 1 tablespoon of flour, and pulse once more until flour is mixed in. Test again. If not holding together, add up to 1 more tablespoon of flour and pulse again. Form balls of meat-and-chile mixture just a smidgen smaller than golf balls. Arrange on a baking sheet. Refrigerate briefly while you ready the batter and oil. Beat egg whites with a mixer until soft peaks form. Stop mixer, add egg yolks and 2 tablespoons of flour, then mix again just until combined. Warm about 3 inches of oil in a broad saucepan or deep skillet over medium heat to 350° F. Place 1/2 cup flour in a shallow bowl. Arrange several thicknesses of paper towels within easy reach of stove. Dredge balls first in flour, then in egg batter. Your first few may look a bit free-form rather than like perfect spheres. Experiment to see if you find batter-dipping easiest with fingers, using a small spoon as a scoop, or spearing the balls with a thin-tined fork. Gently add balls to oil, a few at a time. Balls will sink to bottom, then rise back up to top of oil. Fry until batter coating is puffed, golden-brown, and lightly crisp, about 4 minutes. Nudge balls around a bit with a slotted spoon as needed to fry evenly. Using slotted spoon, drain them on paper towels. Continue until all chiles rellenos balls are fried, adjusting oil temperature as needed to keep it steady. Eat warm. Cheryl Alters Jamison is New Mexico Magazine’s contributing culinary editor. See more of Douglas Merriam’s photography at douglasmerriam.com.